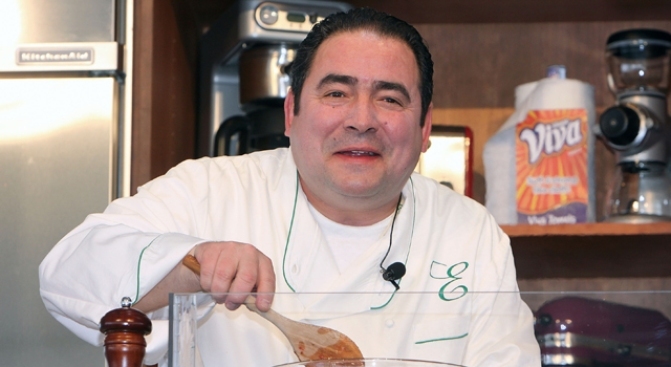 Emeril Lagasse signs his new cookbook downtown. Love him or hate him ("Bam!"? That's your catchprase? ), you can't deny gregarious chef Emeril Lagasse's grip on a certain large slice of the American consciousness -- or his landgrab of everything from restaurants (he owns 10) to cookbooks (he's published a dozen, all bestsellers) to TV (these days he's a food correspondent for Good Morning America and shooting the eco-cooking show Emeril Green for the Planet Green network, while his namesake shows Emeril Live and Essence of Emeril are never far away on the dial). His new cookbook, Emeril at the Grill, is his thirteenth to date, and probably his most man-friendly (what with catchy chapter names like "Things With Wings"). He'll be at the Wall Street Borders today, introducing (and signing copies of) the how-to tome, which we're thinking your dad would love to unwrap on Father's Day. Just a hunch.